A UNP candidate contesting the local government election for Hambanthota Pradeshiya Sabha has been arrested by Ambalangoda Police distributing Rs 5000 vouchers to get people to vote for him. The person has been arrested in Uda Baragama area in Ambalanthota with vouchers in his possession on information received by Hambanthota District Election Complaints unit. In the Rs.5000 vouchers ‘Food City’ had been stated and Ambalanthota Police is conducting investigations. 165 incidents of election violations have been reported since the beginning of voting for the local government election today (10th) states the Network for Election Monitoring of the Intellectuals for Human Rights (NEM – IHR). This is stated in a communique issued by the Chief Executive Officer of the NEM – IHR Dr Udiga Gunasekera. The Leader of the JVP Anura Dissanayaka cast his vote at Abeysingharamaya Temple at Panchikawatta today at 10.00 a.m. The Leader of the JVP group of candidates for Colombo Municipal Council Dr Ranil Jayasena was also present. Sri Lanka achieved a comprehensive 215-run win over Bangladesh on the third day of the second Test played today (10t winning the series 1-0. Off-spinner Akila Dananjaya took five wickets in his Test debut and Bangladesh was bowled out for 123 runs in the 30th over of its second innings, chasing 339 for an improbable victory. Dananjaya returned figures of 5/24 in the second innings and had 3 for 20 in the first innings. On Saturday, Sri Lanka ended its second innings on 226, adding to its 222 from the first innings. Bangladesh scored 110 in its first innings. Roshen Silva, the debutant, who scored 56 in the first innings and 70 not out in the second innings is the man of the match and man of the series. No demonstrations related to the local government election would be allowed for a week after the election states police headquarters. It has informed all police stations to arrest all candidates and supporters who go on illegal demonstrations after the results are announced and take legal action against them. Any demonstration or a public event should be held after obtaining permission from the relevant police station said a senior police officer. A candidate contesting the Local government election for Rambukkana Pradeshiya Sabha from the UNP has been assaulted and threatened by a group of supporters of the same party and has been asked not to cast his vote. The candidate has been admitted to Mawanella Base Hospital say police. 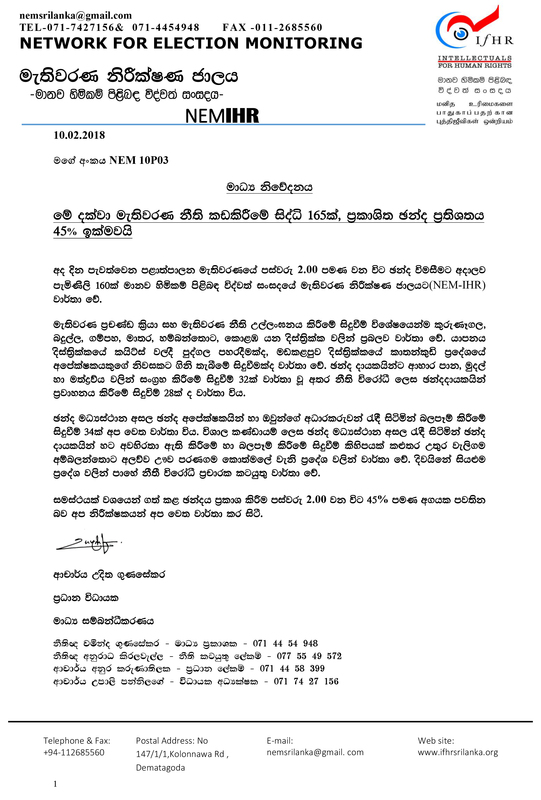 The incident had taken place at Baddewela area yesterday (9th) when the candidate had gone to a shop in the area. He had received an anonymous phone call threatening him not to go to the polling centre to cast his vote. After a few minutes, a gang of thugs had arrived in a jeep and had assaulted the candidate. According to reports the gang of thugs had been lead by several members of the UNP. The wife of the candidate who got himself admitted to hospital has lodged a complaint at the police. Police investigations are continuing. The Network for Election Monitoring of the Intellectuals for Human Rights (NEM – IHR) in a communique states the public should use their valuable vote to elect righteous people’s representatives who had not or will not engage in frauds and corruption. 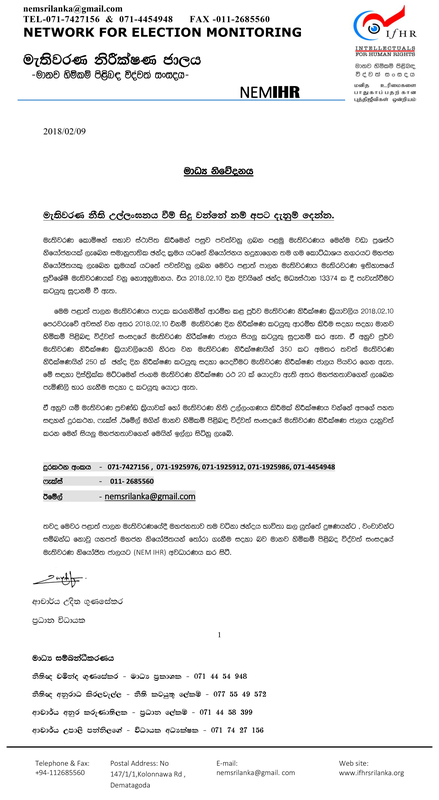 The communiqué signed by Dr Uditha Gunasekera, the Chief Executive Officer of NEM – IHR, asks the public to inform any election fraud, election violations or election-related violence to the organization. The voting for the local government election commenced at 7.00 a.m. today (10th) and voters will be able to cast their votes until 4.00 p.m. today. Polling takes place at 13,374 polling centers states Elections Commission. The election is held to elect 8356 councilors for 340 local government councils. 44 registered political parties and 221 independent groups have entered the fray. The number of candidates for the election is 57,219 while 15,760,867 voters are eligible to vote at the election. The election is held under a mixed system of proportional and first past the post method. The ballot paper consists only the names of the political parties and independent groups and their symbols. The voter has to vote only for the symbol and no other mark should be made states the Elections Commission.